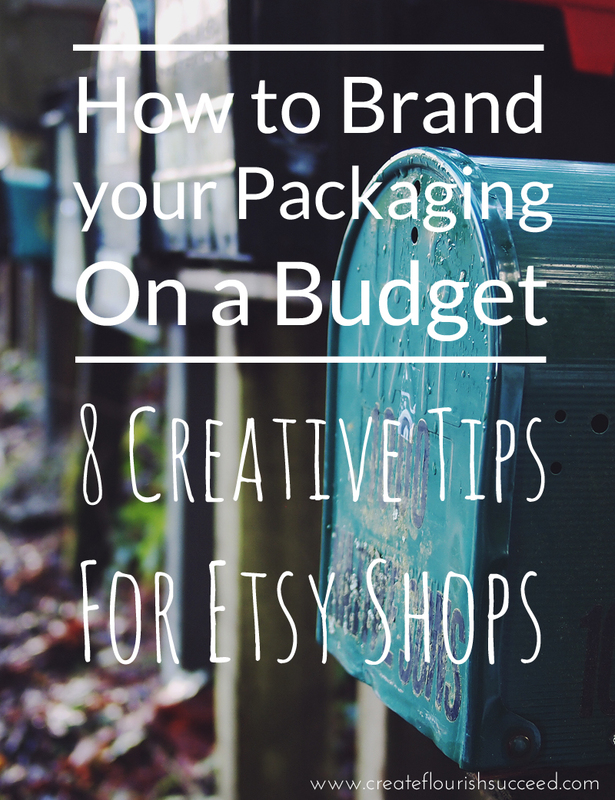 Brand your packaging on a Budget! 8 creative tips for Etsy sellers. Everyone knows branding is important. And when you run an online shop your packaging is a great way to help your product stand out and re-inforce your brand message. And the good thing is, it doesn’t have to cosy a fortune! Here’s 8 tips on how to make the most of your packaging for Etsy shop. Branded packaging helps to create a streamlined and cohesive shopping experience. Your customer will be aware of your brand’s message (possibly subliminally but it will have made an impact!) from first finding your Etsy shop through to purchasing your products. When your package arrives, with the same branding, it will re-inforce the message still further. Your customer will know instantly who their post is from and, along with first rate customer service and a quality product, that will keep you at the forefront of their minds when they need (or want!) more of your products. Branding your packaging makes you look professional. Yep, if you want to look like a ‘proper’ shop, branded packaging will definitely help. Online shoppers have certain expectations when it comes to their shopping experience and if you can match (on a small scale) what the big retailers do, you are showing you know what you’re doing. Attractive branded packaging send a message to your customer of professionalism, care and attention to detail. You know what I said about matching the big retailers…. what about surpassing them? Your customers are purchasing from you because you are selling one of a kind, handmade goods. They’re not going to be wow’ed by you just lobbing it in a an envelope. Make your packaging match the uniqueness of your products and you’re showing your customers how much care and attention you put into all aspects of your Etsy shop. Use labels to ‘seal’ your envelopes or packages. You can purchase blank labels to print yourself or you could get them professionally printed from a company like Moo. You can simply print your logo on them, or a fun message like ‘open me’ printed in your business colours. Use ribbon or baker’s twine to ‘wrap’ your parcel. I love baker’s twine, it is the perfect complement to handmade products and comes in a wide variety of colours. You can use twine or ribbon to hold multiple items in an order together, attach a tag or just tie it in a bow to make your package look like a parcel. Wrap your products. Making your product wrapping look like a parcel adds to the experience of shopping for a unique handmade item. Especially if you sell gift or luxury items. Wrap it in tissue paper or handmade wrapping paper in your brand’s colours to continue your shop’s branding through to your packaging. Include a hand written Thank You. A hand written thank you note really shows you’ve taken a little extra time over packaging your customer’s order and really appreciate their custom. Write your message on a swing tag for the full on parcel vibe for your packaging. Brand your address labels. Include your logo on your return address labels and your customer address labels. Printed labels look professional and using the same fonts as your logo and website keeps your branding consistent. Make your packaging consistent with your brand ethic. Do you pride yourself on your eco friendly products? Then use recycled packaging. Do you sell luxury jewellery? Box it up in a heavyweight box tied with a gold ribbon. Do you sell art prints? Get your art turned into cards for sending out as thank you notes. Your brand is not just your logo, colours and fonts, it’s the story you want to tell about your business. Include your branding on your outer packaging. It’s quite easy to make your inner packaging attractive but what about the outer packaging that has to be functional above all else. One simple way is to get a custom stamp made, either with your logo or a relevant message to stamp the outer box or envelope. Don’t go overboard, you don’t really need to do this if your address labels have your logo on but it pays to have your shop name in as many places as possible. Who knows, someone at the post office might sneak a look at your shop if they’re having a quiet day as well!! I bet you’re feeling inspired now to go the extra mile with your packaging for your Etsy shop. So, here’s a little shopping list (with suppliers). Because I’m super helpful like that! Labels. You can purchase clear or white labels to print yourself at Label Planet. Templates are included for (fairly) easy set up. If you want printed labels head to Moo. Their ‘printfinity’ technology means you could have all your labels printed with something different on if you liked! Custom stamp. Check out Etsy for custom handmade stamps made to order. I love supporting other handmade businesses to help me run mine. Business cards. Head to Moo. You won’t be disappointed! 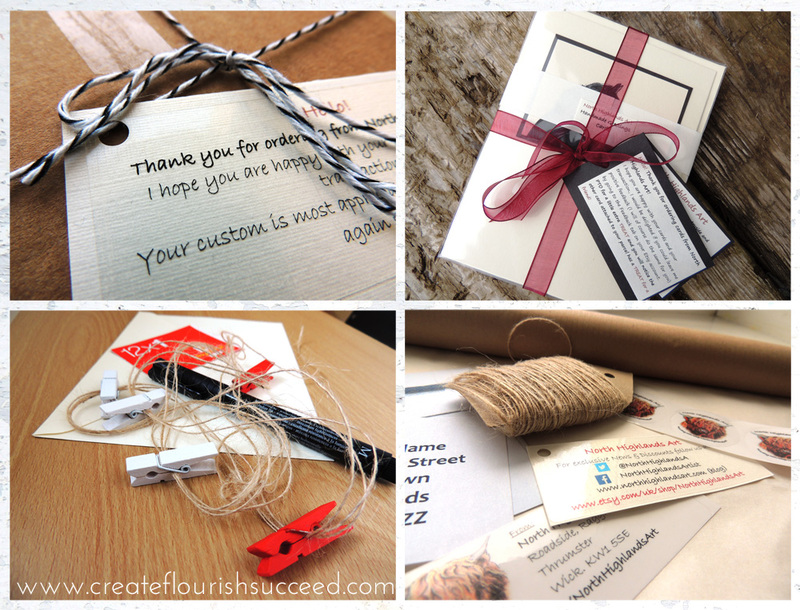 Twine, ribbon and hang tags. The Lemon Cat Shop is a UK Etsy shop that I can personally recommend. The service is great and the range of packaging and craft supplies is huge!